Go Mini! 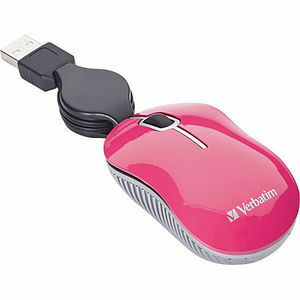 The Verbatim Mini Travel Optical Mouse works great on the go. The ultra-compact design takes up very little space and is perfect for notebook users. The optical travel mouse features a convenient retractable USB cable - no need to wrap the cord around the mouse or deal with tangles. On a plane, train or in a car, plug this mini mouse into your USB port and start dragging and dropping files. This portable mouse works on any computer with a USB port.